KAMPALA. She’s called Amanda Ngabirano. Her profile reads like ‘MSc Urban and Regional Planning and Development University of Greenwich UK; and Urban Planning Lecturer Makerere University.’ My interactions with Amanda have been limited to internet means, where I chance on watching clips of her interviews and other activities, or chat and exchange email, so I can’t put a three-word summary of what she cuts it out like in real life. You know, films and TV interviews can be done in such a way that leaves a tad of invisible deception flying here and there. But from Amanda’s passion for cycling as a clean transport and advocacy for cities to be considerate enough in their planning to cater for cyclists, she would pass for the ‘feisty cycling lecturer’, no? Those in Kampala have probably seen Amanda. She rides a bicycle on the busy streets with the free spirit of a butterfly dating a glorious flower, leaving boda boda cyclists awestruck. 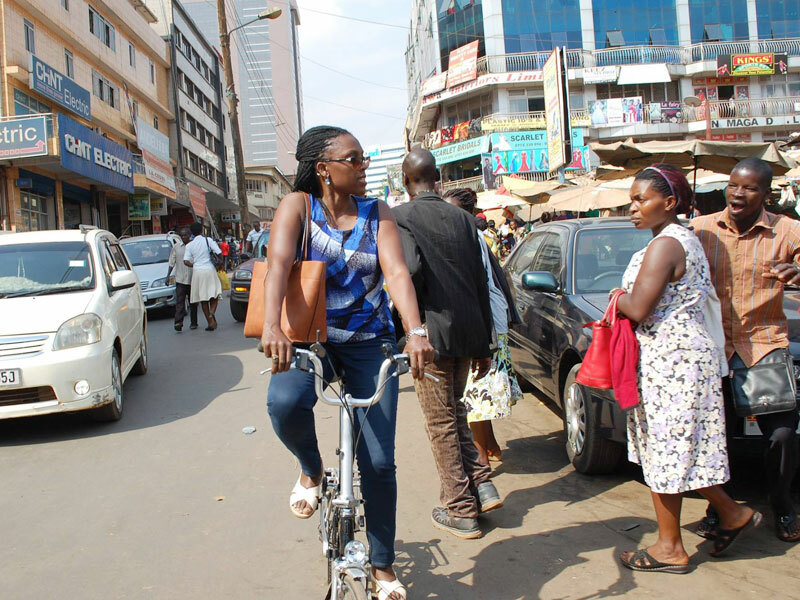 A lady dressed for corporate office, her bag slung across the shoulder, riding on Kampala’s crowded and bumpy streets that many consider death traps is some site. But if you could speak to a butterfly on a date with some flower, just where would you start from? What would be your first question to Amanda? Of course, she owns a car. “If you are worried about my safety, you wouldn’t want to be in my husband’s shoes. He wants to stop me from riding. He may run announcements soon that I should be arrested if seen riding in this city,” Amanda jokes of how her family feels about her safety on the road balancing the metallic horse with two wheels. Her 17-year-old daughter has resigned to the fact that the mother will ride to her dreams, while the son, 11, still can’t understand why mom won’t turn the ignition key of the car instead. And a fight she is determined to take places, beyond the borders and across the Atlantic, to see Uganda and the world come to terms with bicycles as effective means of transport in cities. This verve has seen Amanda making it into a global film dubbed, “Cyclologic,” a film about changing the one bicycle at a time, as the Swedish film directors who first shot her riding experience put it. Cycologic film debuted at the Malmo Film Festival in Sweden in August 2016. On Sunday, Amanda was in Edinburgh, Scotland, for the screening of Cycologic, an event preceded by the Velo-City Conference in Arnhem-Nijmegen, Netherlands, where Kawempe Division mayor Emmanuel Sserunjogi presented the case for Uganda, noting regretfully that the city remains acerbic to cyclists. Last year, Eng Andrew Kitaka, the director of engineering and technical services at Kampala Capital City Authority (KCCA), told The New Vision that city planning had been biased toward motorised transport for too long. “We want to change this because most people are into walking and cycling but not cars,” he was quoted as saying by the daily. If KCCA were to pull this off, Amanda, 38, would be the happiest. The mother of two is known for going hysterical on seeing an African city street with a cyclist lane. Her dream is to end that look of pity we all give those who use bicycles as a means of transport. “If we envisage the future of our cities as mainly car-oriented, then that will be one of the biggest mistakes we will have ever made, given the urbanisation rate, and the fact that there is no city that runs smoothly only on private cars, and no car user is comfortable with the increasing car menace and enslavement,” Amanda said at a conference on cycling in Kampala last year. Well, it might be strange, but this bicycle bug that has become Amanda’s passion is not something she was weaned on. She actually learnt to ride at the age of 10. That is pretty old for an African child not growing up on the 10th floor of an apartment or hotel. For her first experience with the bicycle, Amanda recalls that a family friend had visited and they grabbed his blue bicycle and took off with it to a school playground. “He (the brother) started teaching me how to ride… and when my mother got to know, she was so mad at me. She made it clear to me that girls aren’t supposed to ride because they could lose their virginity,” she recalls. Her effort was aborted. Interestingly, nearly 30 years after that stern warning from her mother, Amanda is now madly in love with bicycles. “If there is anything I can’t miss on the road, no matter how I am moving, it’s a bicycle. It just looks so powerful. It is powerful. The two wheels; the pedals, and that ‘human engine’ make it what it is. And it is a shame that for most of Africa, those who use it are pitied,” Amanda says. The Makerere lecturer traces her fascination with bicycle to when, as a student in The Netherlands in the late 2000s, she paid a lot of money to travel by public transport to campus, yet she would arrive late to school compared to other students who rode from her apartment to campus as she had to walk to the station and also waste time at bus stops. “Back in Kampala, I owned travelled mainly by a car, so the idea of riding to campus didn’t tick home with me. But it all seemed normal there; so I bought one at 60 Euros and decided to face the reality; I was a student, it was normal, it was cheap and it was exercise. I gathered courage to learn a ‘man’s thing.’ All I needed was two weeks and was good to go,” Amanda says. The experience with the two-wheel metallic horse would later inspire her to start speaking for and promoting cycling. In 2009 when Amanda conceived the idea to speak for cycling, she shared the idea with her the man she fondly describes as “an amazing super-cool man”—Ngabirano, he husband. The family called it weird. Ngabirano laughed at her and said it was too big dream to come true. “I didn’t get annoyed. I expected it because even my fellow students from East Africa did not understand how that could happen in Africa,” she says. True to her mettle, the persistent paid off when Emilia Stålhammar, Elsa Lövdin and Veronica Pålsson travelled to Uganda to a film project as part of their studies. They wanted to do an inspiring and hopeful film showing a modern Uganda rather than highlighting the negative aspects that so often takes too much space in every media platform. 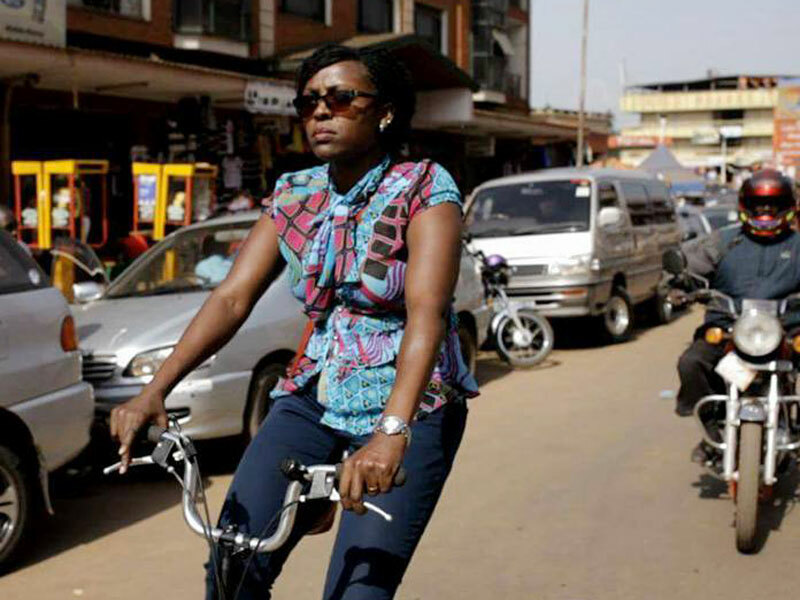 The group happened to land on an article profiling Amanda’s cycling campaign to have bicycles on the streets of Kampala. “This way of movement is something we had never had reflected upon, and is something we take for granted in our daily life back home in Sweden. After our first meeting with Amanda, we were so thrilled and inspired by her enthusiasm and passion for cycling and we felt it was necessary to tell her story. She does not only want to see a change – she creates it herself,” Stålhammar told the World Cycling Alliance, on whose Steering Board Amanda sits. The producers of Cycologic film, armed with the profound belief that cycling can not only strengthen the role of women in society and create debate, but will also be beneficial economically for individuals and society as well as play a crucial role in the climate threat the world faces, went to work. Cycologic film seeks to inspire, show women power to change society for better, and also help people engage in bicycle talks. It also challenges leaders to be concerned that people who ride have not been taken care of in cities that do not have segregated lanes for them. Their production has catapulted Amanda’s campaign to the world stage. Today, the film has been screened in several countries and Amanda has addressed several conferences in Canada, Austria, Netherlands, France, Kenya, South Africa, Brazil, Taiwan, Scotland, among others, tackling bicycle transport. 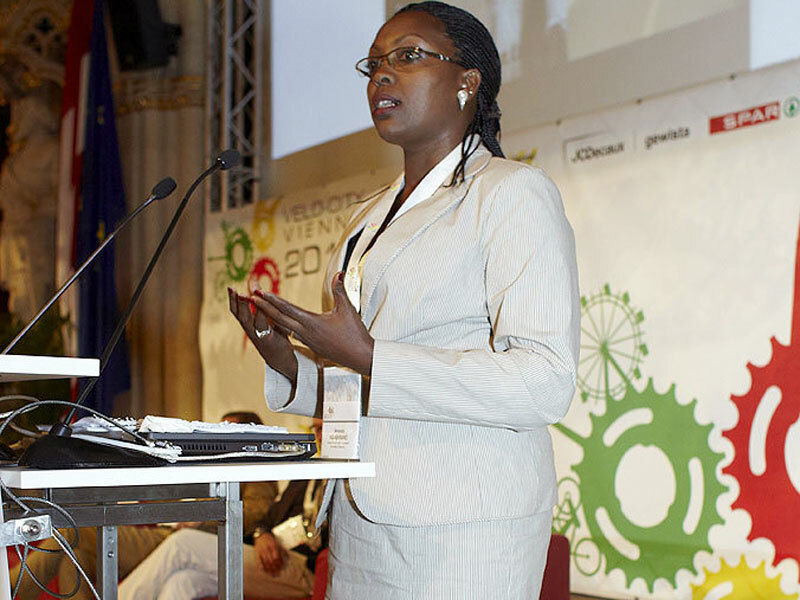 Amanda makes a presentation on bicycles to technocrats and development partners in Kampala last year. At home in Kampala, Amanda last year delivered a presentation on “Mainstreaming Transport in the Sustainable Development Goals: For a Smart Moving Uganda” to the senior technocrats at transport minister as well as development partners, urging that cycling must be integrated into national level policies by showing how cycling-related policies resulted in huge success stories elsewhere in the world. She also showed how the bicycle ties well with the effort to achieve a number of Sustainable Development Goals. For example, cycling not only provides an easier access to jobs, schools, markets and community activities, but also significantly cuts down on CO2 emissions from urban passenger transport. 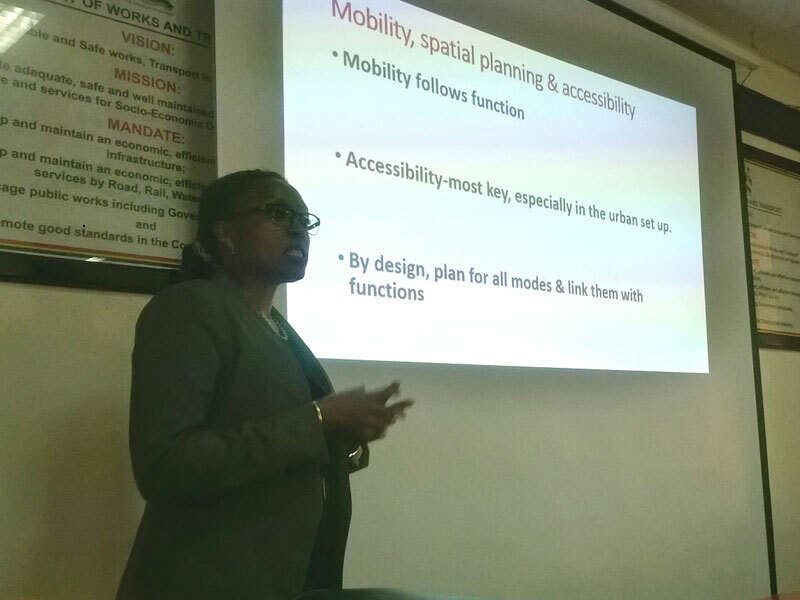 At the end of the symposium, a Dutch consultancy, Move Mobility, offered assistance in guiding the integration of cycling into Uganda’s urban planning strategies. 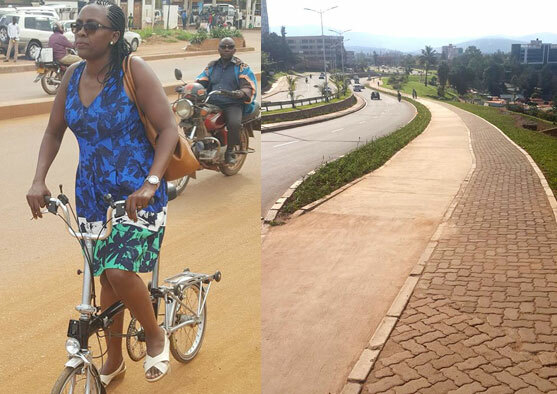 Amanda says she will have to ride on Kigali’s cyclist lanes (right) ‘soon’. The joke about presidency might sound just that, but there is a deeper meaning. 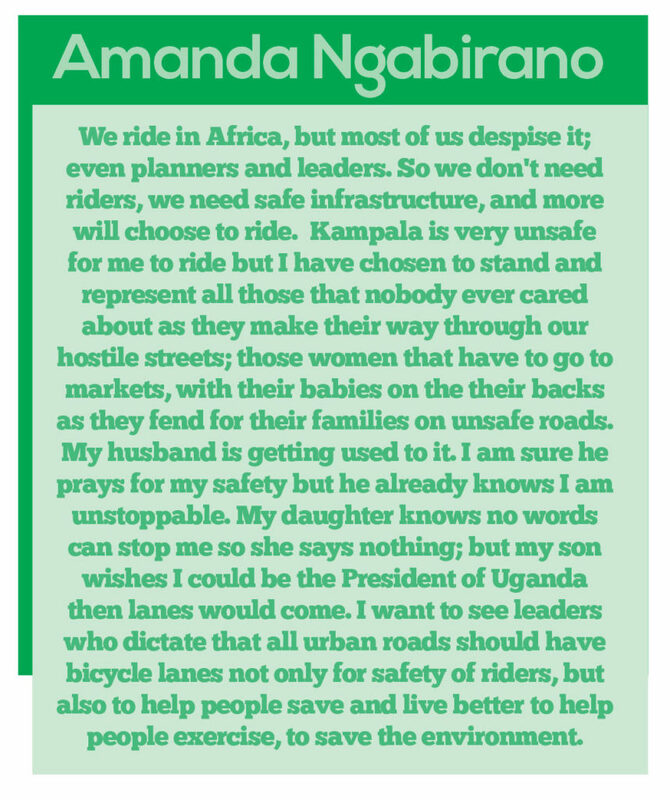 Amanda believes that it will take high-level leadership decision like at the presidency for bicycle infrastructure to be implemented in African cities. She wants to see leaders who dictate that all urban roads should have bicycle lanes not only for safety of riders, but also to help people save and live better…to help people exercise, to save the environment. Shown images of the fruits of Rwanda’s new city master plan that has seen not only new roads decked with neat cyclists lanes but also old ones being revamped to have them, Amanda warms up; I must ride on it soon, she says. But riding is one thing, wearing a safety helmet another altogether. Amanda doesn’t wear one. Apparently, she hates hiding road safety issues as a cyclist behind helmets. “Do you realise that no one questions our riders about why they don’t wear helmets? No one cares. The problem is safe infrastructure and not that helmet. No leader/planner/law enforcer has a right to ask about helmets in a traffic situation as ours. When the lanes come, I will put on the helmet,” she says.